Advantages: Knowledgeable contributors, superb artwork, scale plans, variety of subject matter. There aren’t many publications that regularly cater for World War I aircraft enthusiasts. Windsock Worldwide is one of them and is clearly directed towards the modeler. This latest magazine completes the six issues for the year and a welcome one it is too. Alan Toelle completes his ground-breaking work on the camouflage of early French Nieuport aircraft. To compliment the article, Ronny Bar submits three superb colour profiles which take into account this latest information. Number 11 in the series of Austro-Hungarian Naval aircraft is devoted to the Phönix (Mickl) Types A1 and A2. George Haddow’s article includes a set of 1:72 general arrangement drawings, and three colour profiles from the competent hand of Bob Pearson. His work continues with three more pieces of artwork, this time dedicated to the RAF RE8. It forms part of Les Roger’s commentary on the various formations that flew this important aircraft. The installment here features Nos. 9, 12 and 13 Squadrons. 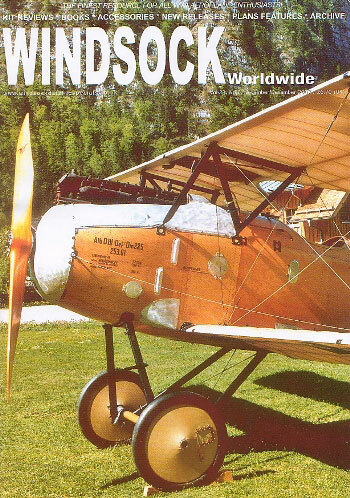 A major achievement was the completion of Koloman Mayrhofer”s Albatros D.III (Oef) reproduction. A photo report from Rudi Höfling provides some excellent detailed shots of the finished product, with the text giving the reader a valuable insight into the project. The usual comprehensive round up of book, kit and accessory reviews follows, along with three bonus Sopwith F.1/3 Comic profiles to accompany the recent Roden release. So here we have it - another issue packed with the usual diverse range of subject matter. The contributors are all recognized authorities in their field, and are only too pleased to pass that knowledge on to the reader.